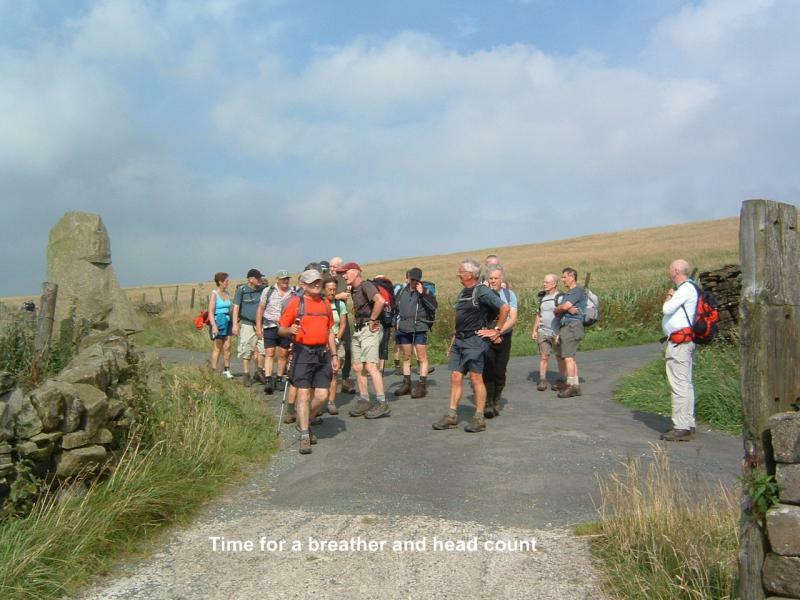 It is a walk within the counties of Lancashire and Yorkshire; the route of which connects three preserved steam railways - the East Lancashire, the Keighley and Worth Valley and the Embsay to Bolton Abbey. July 18th Ramsbottom, Rawstenstall, Bacup, Sharnyford, Todmorden. 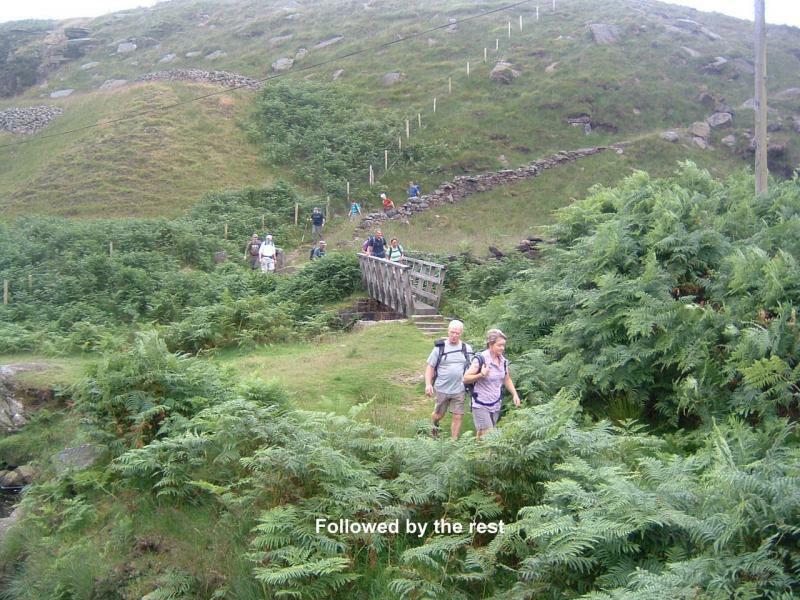 August 15th Todmorden, Midge Hole, Hardcastle Crags, Grain Water Bridge. September 19th Grain Water Bridge, Oxenhope, Goose Eye, Sutton-in–Craven, Silsden. 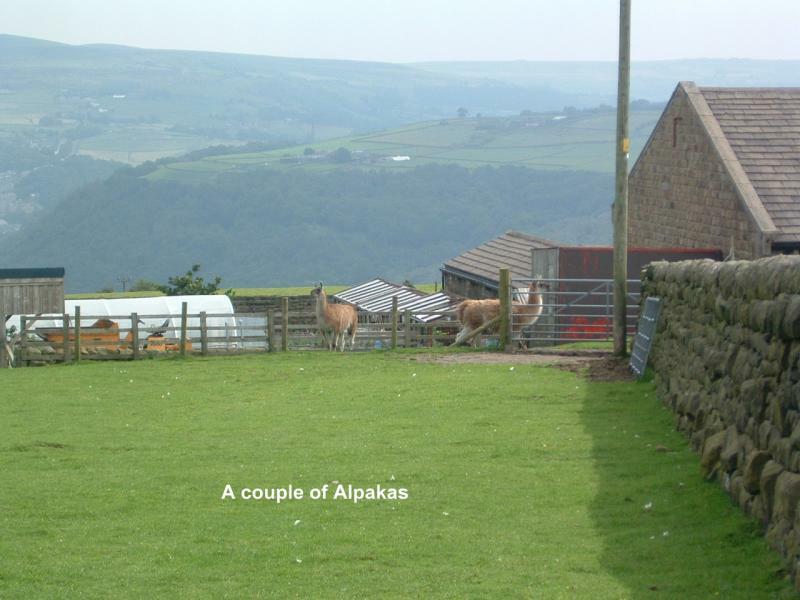 October 17th Silsden, Addingham, Bolton Abbey Station, Embsay. 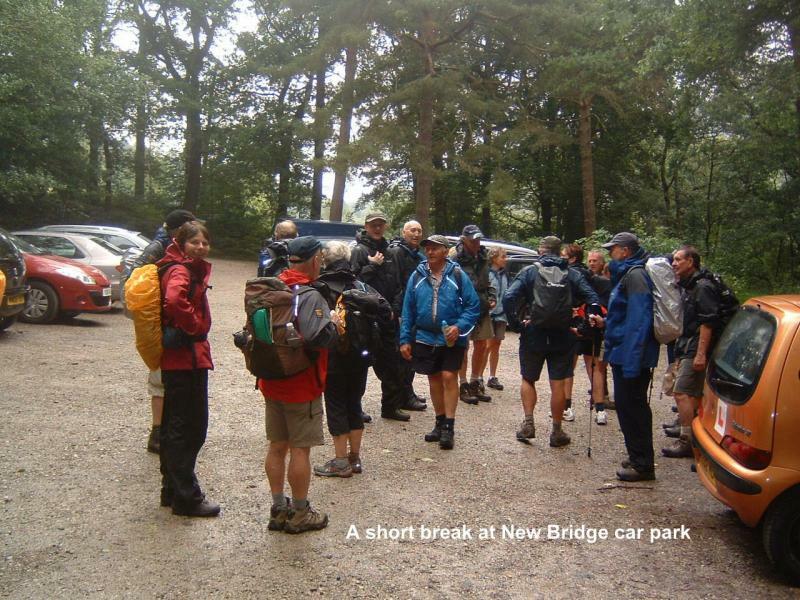 All walks are on a Wednesday and will be approximately 14/16 miles in length. The walks will be led by the team of Norman Thomas, Ian Pickup and Chris Langabeer. 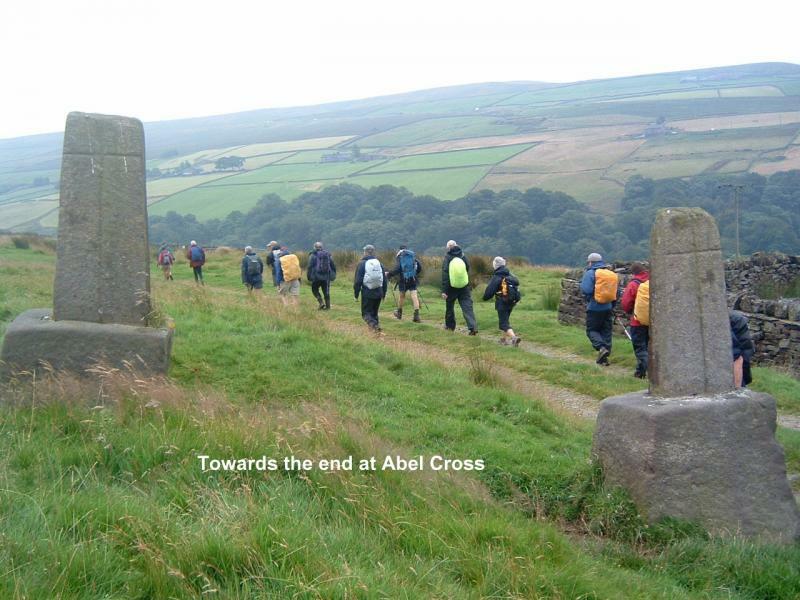 We will meet at the end of each section and a coach will transport us to the start of the walk, for which the cost will be £6. Booking is essential. For further details please contact Chris Langabeer on 07790250852 or email christopher.langabeer@ntlworld.com. Twenty four people steamed off from Ramsbottom railway station at the start of the Heritage Trail, a route which links three heritage railways. These are the East Lancs, Keighley &Worth Valley and the Embsay& Bolton Abbey railways. The route description has the first leg down as 14 miles but our noble leaders Chris, Norman and Ian warned us it was more like 18 miles!! The morning saw us heading out of Ramsbottom along the Irwell, up to Edenfield and along the tops before dropping down to the former Groundwork Centre, now a private members gym, near Rawtenstall. Here we stoked the boilers with Tracey’s excellent scones with jam and cream. On through Rawtenstall, where the East Lancs railway now terminates, and out in a north easterly direction before dropping down to Waterfoot and on to Edgeside Park for lunch and wetting the whistle. We all worked up a head of steam slogging over boggy moorland to reach Bacup, then it was up to Sharneyford along the road for a short stretch before branching out on a moorland track and waymarked path, where a small gang, spurred on by Norman, put back a fingerpost that had fallen over. A bit further on an area of man-eating bog lived up to its reputation but Mike was quickly rescued and was soon back on track. The journey took us through the most charming section, past Gorpley Reservoir and down through Gorpley Clough Woods, a very scenic stretch. Further on we picked up the Rochdale Canal which took us into Todmorden past the ‘Great Wall of Todmorden’ as Chris informed us, this being a massive retaining wall on one side of the canal. We finished off coasting through Centre Vale Park to hit the buffers at the nearby leisure centre. A brilliant walk, thanks to our trusty leaders, and we’re all looking forward to the next stretch. Once again a group of 24 people assembled for a section of the Heritage Trail; on this occasion at Todmorden Sports Centre at Centre Vale Park. This was to be the only part of the walk where none of the three heritage railways would be encountered. 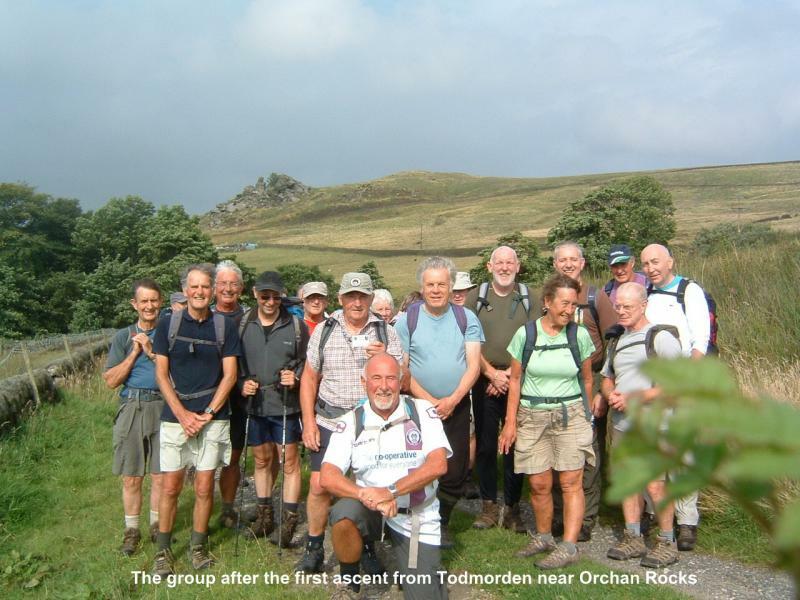 The group set off following the Calderdale Way uphill out of Todmorden to reach the Whirlaw Stones (an ascent of almost 300m) from where the Todmorden Centenary Way was taken heading east towards Great Rock some two miles distant. 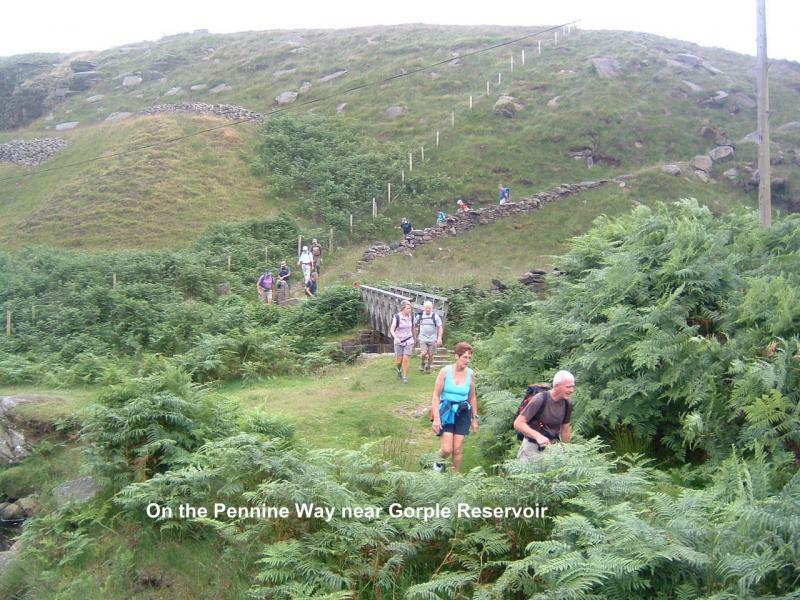 At Great Rock the route turned abruptly northwards proceeding, via Hippins Bridge, to Blackshaw Head and Jack Bridge in turn, on the way to Gorple Lower Reservoir. Near the reservoir there was a short, sharp descent into the gulley containing Graining Water. 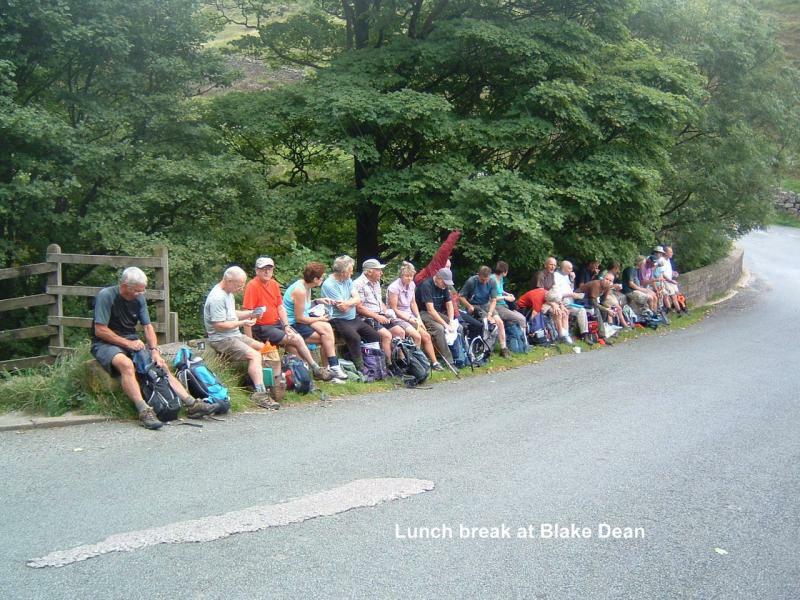 After climbing out of the gulley an attractive contouring path through the bracken on Ridge Scout was followed, which led to Blake Dean and the lunch stop. At Blake Dean there is a Scout Hostel which surprisingly seemed completely deserted on this occasion. 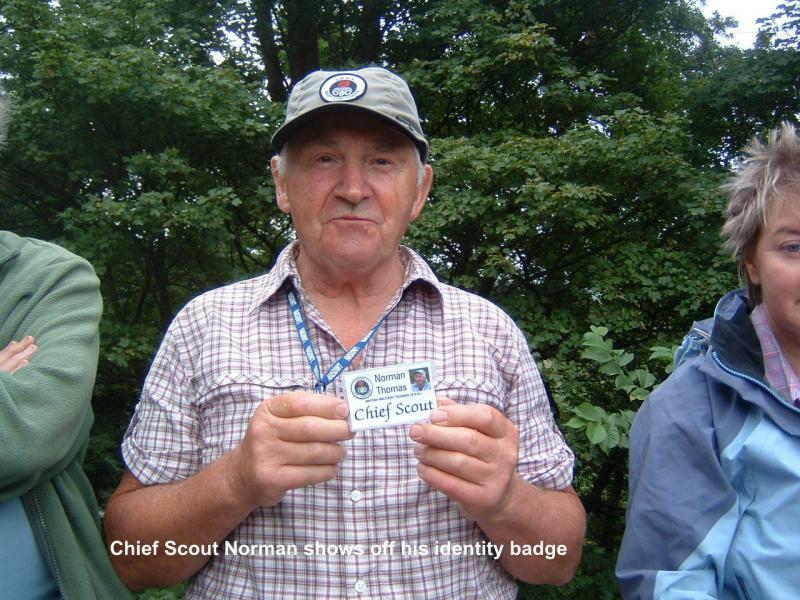 Up until the lunch break our Chief Scout, replete with new official badge, had adopted a somewhat lower profile than usual. 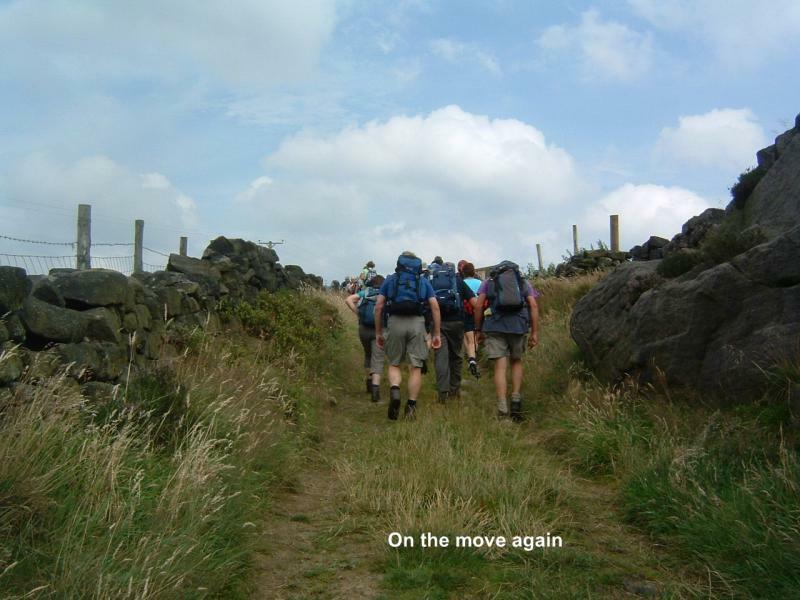 However, after lunch he came to the fore leading the group off into Hebden Dale. His badge which, incidentally, was worn discreetly when other people were likely to be encountered, indicated that he is SAS trained (‘Saturdays and Sundays’ apparently!). 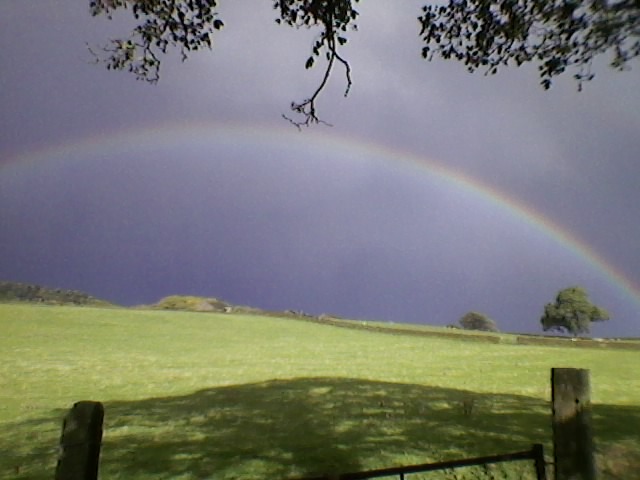 It was during this stretch of the walk that the rain, which had first appeared during lunch, became heavier. However, because of the tree cover it was not a major inconvenience at first but by the time that Gibson Mill was reached most people saw fit to don waterproofs. 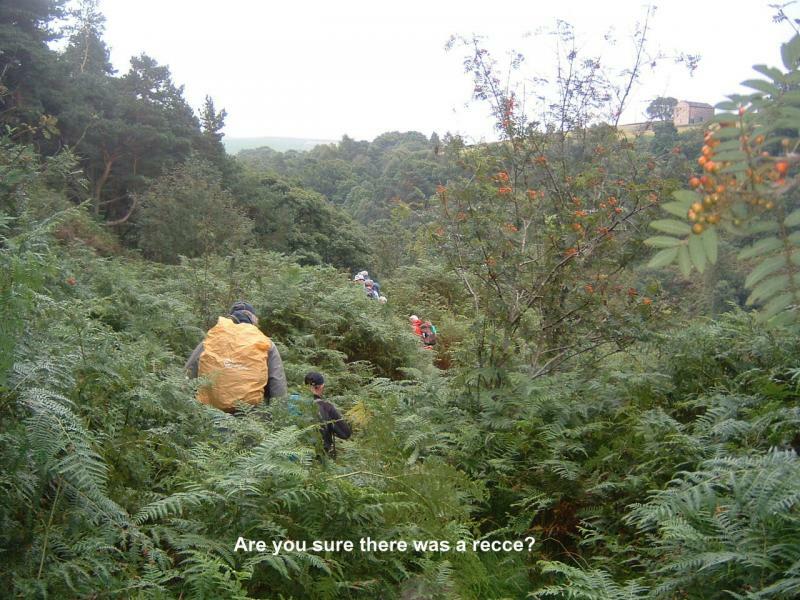 After water bottles had been topped up the walk continued down Hebden Dale to New Bridge. From New Bridge the route cut back uphill to Shackleton and emerged into fields as far as Abel Cote. It was here at Abel Cote that the Chief Scout’s navigation let him down and he led the group slightly off-route. Undaunted he demonstrated that such a situation can be recovered by the simple expedient of climbing over a locked farm gate! A good track from Abel Cote led to the original planned finish of the walk at Grain Water Bridge. The extension to the walk, necessary in order to find suitable parking at the end, involved a long ascent to the highest point on the Heritage Trail; Top of Stair at 425m. As the top was approached the rain, which had earlier abated, started to return with a vengeance driven on a strong wind. The last mile or so along the drain, which led from the Heritage Trail to the car park on the A6033, was walked in absolutely appalling conditions. Despite the soggy finish the walk appeared to be enjoyed very much by those who took part. For much of the route exceptional views of the surrounding countryside were obtained. 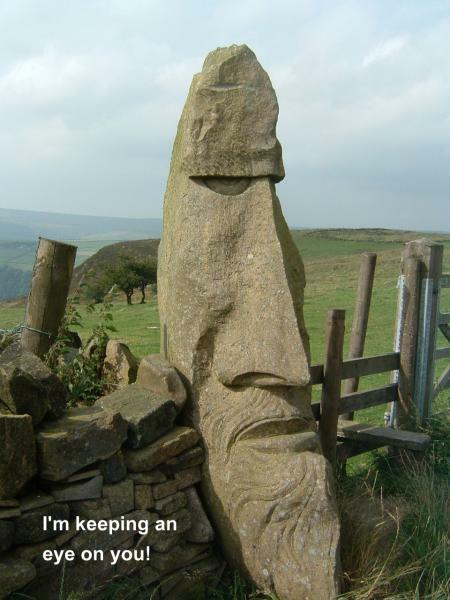 Myself and my co-conspirators are looking forward to leading Part Three which will take us to Silsden on 19th September. Thank you to Don for the pictures. The Heritage Trail - Part Three. Wednesday September 19th. Grain Water Bridge to Silsden. 17.3 miles. 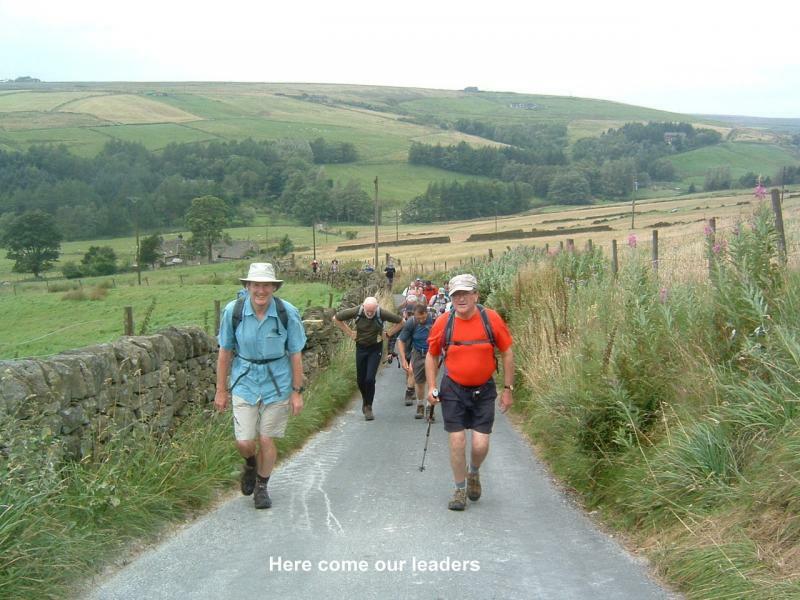 After meeting up in Silsden, our coach transported us to the start of the walk 2 miles South of Oxenhope. 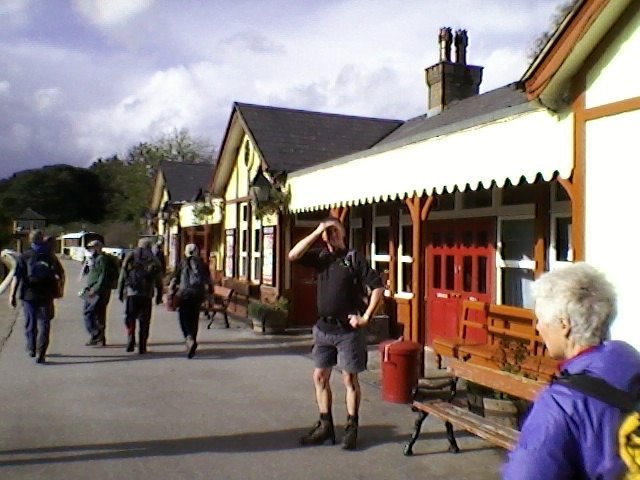 After crossing the moors the railway station at Oxenhope was soon reached. Chimney's" in the Railway Children film. 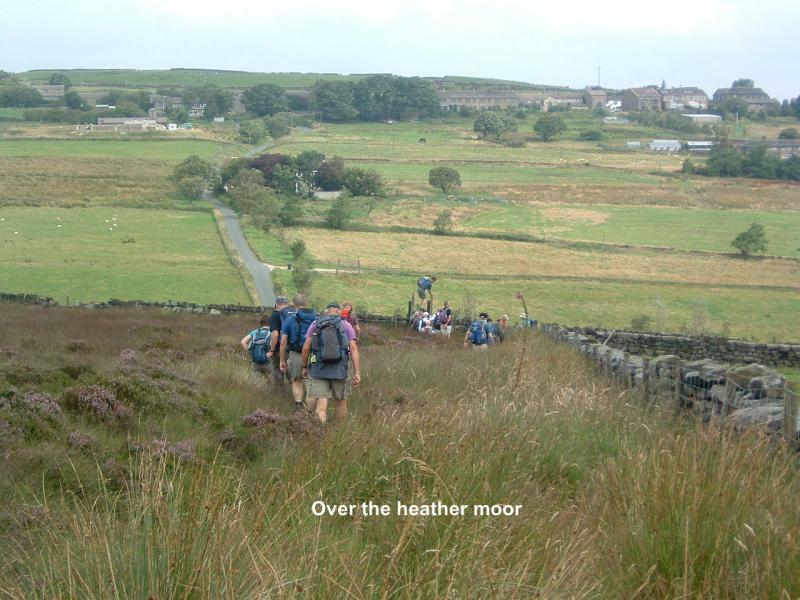 The route continued into Haworth with all its conections to the Bronte sisters. Passing the Railway station in keeping with our Heritage trail theme. in Craven with it's impressive arched entrance lodge to the now demolished Sutton Hall. Onwards we walked to reach Kirkgate Village passing the old school house to cross the Leeds Liverpool canal. This was a delectable spot with a church, old School house, and a fine flaged path to follow. It was a climb now up onto Farnhill moor, through heather and bracken to suddenly reach a monument to commemorate the silver jubille of King George V which gave us wonderfull views over Airedale. From here it was generally downhill all the way to reach our cars at Silsden. There is one more section of the trail. Continuing our railway theme we will pass Bolton Abbey Station to reach our last Heritage railway at Embsay. Thanks to Don for the pictures. Heritage Trail Part 4. 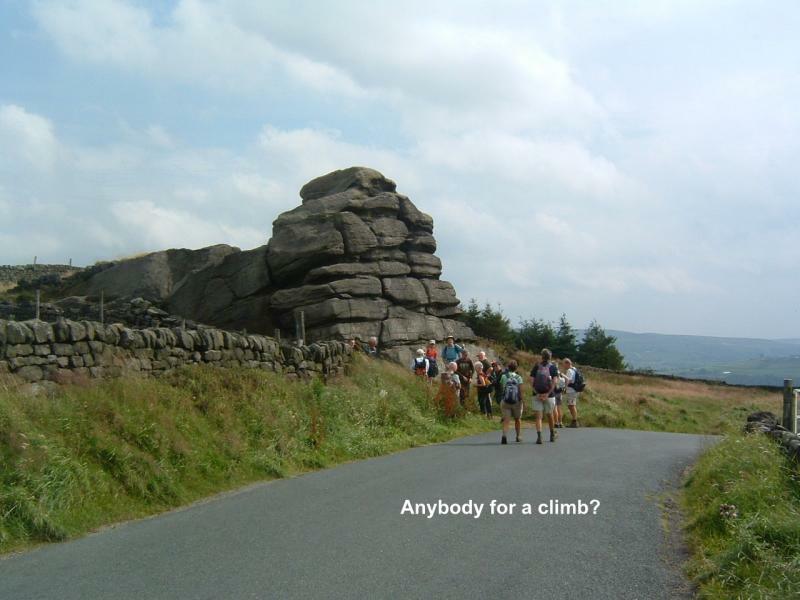 Silsden to Embsay, 14 miles. The concluding section of this railway-themed route saw thirteen of us enjoying the countryside between Silsden and Embsay. After the wild weather overnight, waterproofs were donned at the start but soon shed as the sun came out. The Leeds-Liverpool canal was our initial route as we headed east out of Silsden before crossing on a swing bridge to bear north towards Windgate Nick. We had been warned that we were in for a fairly tough 14 miles and we were certainly aware of this as we steamed up and over the shoulder of the hill. Heading for Addingham now, there were fine views ahead of Beamsley Beacon, north of Ilkley, which looked very tempting. 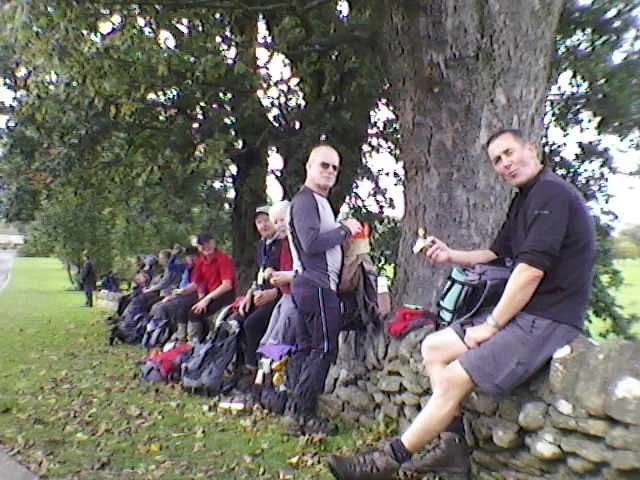 The lunchtime stop in Addingham provided an opportunity for those with weaker wills to ‘stoke up’ at the chippy, then it was on across the mighty Wharfe followed by another long climb up to a newly renovated property, The Footings farm. After passing the Devonshire Arms (no pit stop here!) it was on to Bolton Abbey Station for a photo opportunity with Thomas before pressing on for the final coast into Embsay with fine views of Embsay Crag. After a look at Embsay Station it was time to water up at the Cavendish Arms which our leaders had arranged to be open especially for us – well done chaps! And guess what – free bowls of chips were supplied! The Heritage Trail has been an excellent route, and very well organised by Chris, Ian and Norman, so a really big ‘thank you’ from all of us.